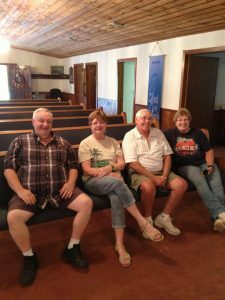 We made the journey to Wappapello Methodist Church in Missouri recently to install some new church pews and found that Wappapello is right in the middle of beautiful surroundings that reminded us that the Lord really is present in all things. On Lake Wappapello, the town is known as a fisherman’s paradise because of the big game fish to be had in the lake. There are plenty of fun community events in Wappapello, from the Kid’s Outdoor Fun Day at the beginning of the summer to the Wappstock festival at the end of the summer before school starts back up. D uring our work in Wappapello, we got to know a few members of the church over pizza during the installation. While we were very thankful for the pizza they brought us while we were working, we were most thankful to share fellowship with the community of Wappapello Methodist. We want to extend our thanks to their church for being so hospitable while we were working on their pews. The pews we installed in their church were made to match the special features of Wappapello Methodist instead of competing against them. You’ll notice beautiful wood features in their church. It’s rare to find a church with solid wood beams for a ceiling and being able to highlight this feature with pews made to match is important to getting the best look for a church like Wappapello United Methodist. 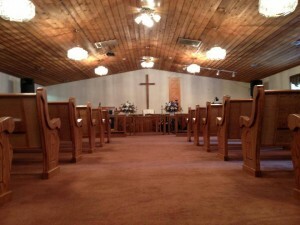 We made sure the pews harmonized with the shade of the wood ceiling by using custom staining techniques. You’ll also notice that the backs of the pews aren’t wrapped in fabric like a lot of our other pews, because we wanted to highlight the wood features of the church. 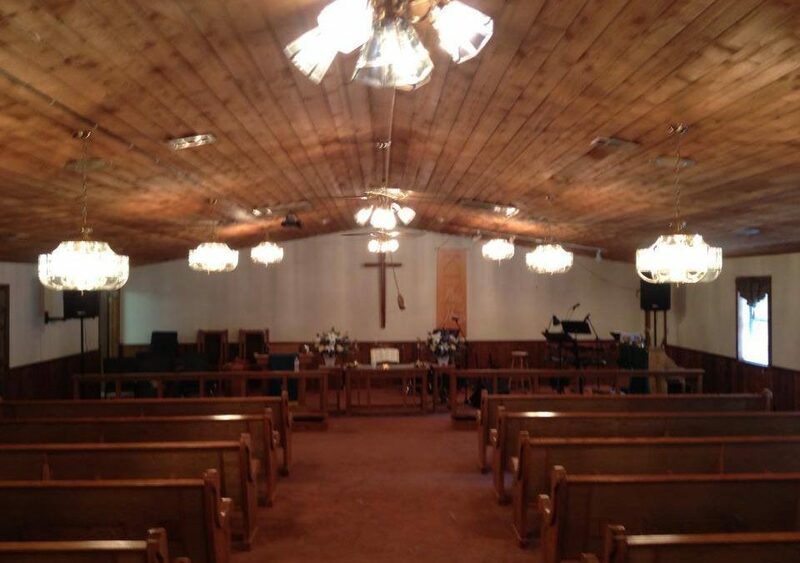 If we had wrapped the entire pew backs and fronts with the dark fabric they chose, the church pews would compete for attention instead of complement the unique ceiling. When we encounter a church with special aspects like Wappapello Methodist, we always try to do the best we can to highlight those features instead of cancel them out. 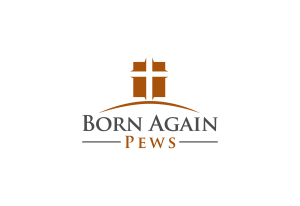 If your church has special details you’d like to keep in mind while looking for new church pews, we can help.